This is an embedded &amp;lt;a target=’_blank’ href=’https://office.com’&amp;gt;Microsoft Office&amp;lt;/a&amp;gt; presentation, powered by &amp;lt;a target=’_blank’ href=’https://office.com/webapps’&amp;gt;Office Online&amp;lt;/a&amp;gt;. The Naugatuck Valley Council of Governments (NVCOG) is conducting a multi-task engineering and planning study related to the assessment and feasibility of implementing alternative transportation modes within the Route 8 and Waterbury branch rail line corridors. This project is Task 3 of a combined state and federal planning effort to promote sustainable communities and advance livability goals by implementing policies and taking actions which increase transit services and encourage land use development along the corridor. It is an outgrowth of the NVCOG’s partnership in the New York and Connecticut Sustainable Communities Consortium, a joint HUD, EPA and US DOT initiative. Identify new, enhanced and alternate public transit facilities and services, including local bus service, bus rapid transit routes and commuter rail, to transform town centers into vibrant, high-density communities that have access to efficient and high quality transit services. Provide built environment densities that meet transit supportive standards for land uses and walkability, in order to facilitate and encourage the use of enhanced transit services. Enhance transit connectivity, reliability and attractiveness. Develop an implementation plan for incentivizing transit oriented and supported developments in the lower Naugatuck Valley Region. Advance HUD’s livability principles and extend sustainable communities. 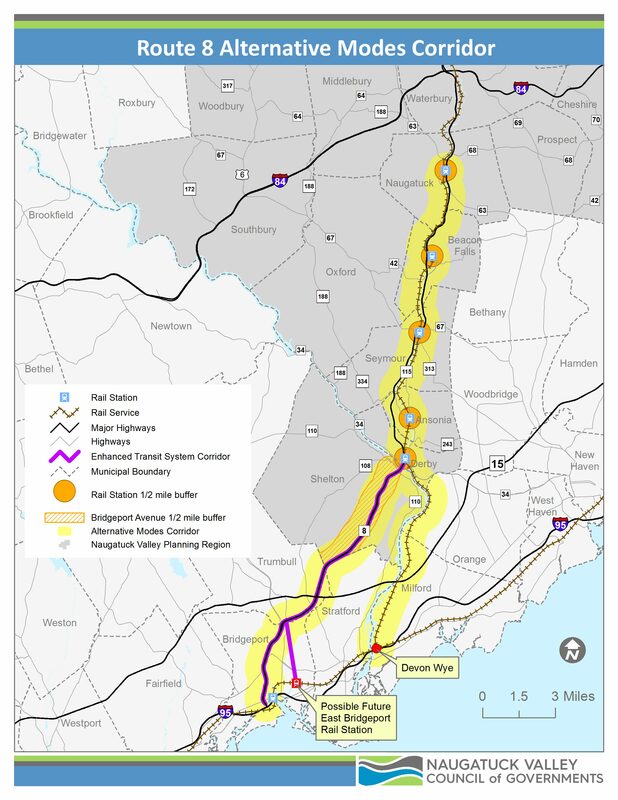 The project study limits generally extend from Shelton to Naugatuck, through Derby, Ansonia Seymour and Beacon Falls. The target areas are focused on the town centers of these communities in and around the commuter rail stations.